It has been said that bread is the staff of life. However for those who follow a gluten-free diet or observe bread avoidance for weight maintenance or celiac disease, this is not the post for you! Saturday, January 19 was the first day that handmade bread by Mark Stambler could be had (legally!) 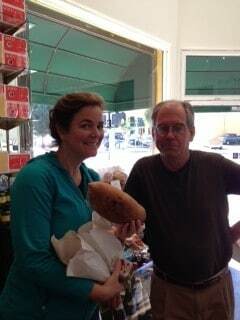 in a traditional retail setting, and we were there to both celebrate and procure some of that delicious bread. The best bread, a must try with raisins and walnuts! 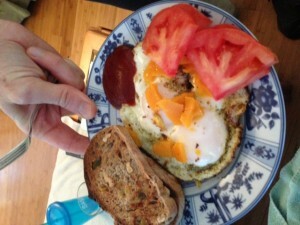 Los Angeles County Permit #194151, Proudly made in Mark Stambler’s home kitchen. Mark is a local resident of the Atwater/Silver Lake area. Supporting local made artisanal products! 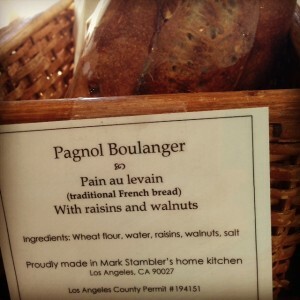 Pagnol Boulanger, in several varieties, is now for sale at gourmet store and cafe Say Cheese in Silver Lake. It is also available via a local CSA and at times at the Atwater Village Farm. MARK STAMBLER is here selling his fresh baked bread. You are excited we are excited! Come on down and pick up a loaf or two or three…$7.00 ea.